This British Transport Film from the 1960s enlivened by John Betjeman takes a trip from King’s Lynn through the wide, flat fields of Norfolk to Hunstanton and the sea. It sums up a quality of insight and commentary on towns and countryside which has all but disappeared. Betjeman’s holistic approach blends history, poetry and design with people’s lives and the towns and countryside in which they live and work. It’s a refreshing and engaging approach which contrast sharply with the single issue linear thinking of much commentary today. It is gentle and humble – though smug and perhaps medieval too. It seems implicit that this environment should not change. Interestingly, Betjeman was travelling to the home of Alison and Peter Smithson’s Hunstanton School which was completed in 1956. Alison and Peter Smithson were fiercely intellectual and proselytised the cause of Modernism throughout the 1960s and 1970s. 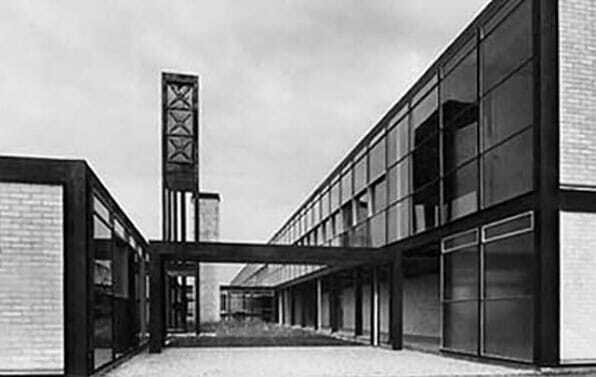 They were unafraid to criticise the prevailing orthodoxy or bring new ideas to the Modernist blueprint. The school is one of the most celebrated buildings of mid 20th century Britain. Since the 1950s and 60s the UK has largely adopted a sort of modernism as the de facto style for interiors – the battle with chintz has been won – although the exteriors of new houses are likely to be Georgian or Tudor. The UK can also welcome individual buildings in a ‘modern’ design (well sometimes…) but is less inclined towards extensive areas of new building in a contemporary idiom. The message is that towns and countryside should be old but buildings can be modern …maybe. Perhaps in reality Betjeman and the Smithsons got on.